Point-guard Darren Collison, who suffered a hip pointer injury against Washington, still feels soreness in the area but his condition is improving. Collison had one of his finest games of the season against Washington State, scoring 18 points including a key driving lay-up late in the game to help UCLA hold of the Cougars. Back-up senior center Lorenzo Mata-Real played just seven minutes against Washington State. Howland was asked about Mata-Real's status on the team at his weekly pressor. "He's averaging about 19 minutes a game, our second (actually third) leading rebounder, and leads us in blocked shots," Howland said. "He had a great practice yesterday. He has a significant role on the team. Mata-Real is averaging 3.9 points, 4.9 rebounds, and 1.3 blocks a game in his final season at UCLA. He provides the Bruins depth at the center spot, and his experience and defensive prowess will play dividends for the team sometime down the line, especially during tournament time. The UCLA Athletic department announced Coach John Wooden would no longer sign autographs during games. The request is for fans to respect his privacy and to allow Coach Wooden to watch and enjoy the game. Wooden, 97 years old, has been missing at recent Pauley Pavilion games but it does not have to do with this particular issue, instead Wooden has been feeling under the weather lately. Current Head Coach Ben Howland said he thought the move was long overdue and actually suggested it awhile ago. "When he comes to a game it would be nice to respect the fact that he’s there to enjoy the game," Howland said. "Everyone is so excited to see him, and you understand it - he's a living legend." UCLA over u$c by 25. Love will have a dunk-fest. Hold the Mayo as he will score his 15+ points, but have a big DONUT for assists. Great team player they have there. Can't wait to see the "Rapper" play next year. If anything, it is a colorful team (and I'm not talking about the red and gold). GO BRUINS! I live in Sacramento and it is noteworthy how this Saturday's UCLA-SUC game is totally under the radar screen in locations outside of LA. The TV networks don't even have it listed as a game worth special note or attention. 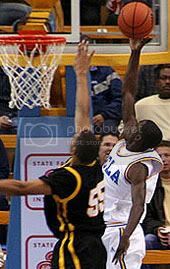 I think with UCLA's strong play as of late and SUC's 1-3 Pac-10 start that SUC is almost a forgotten entity. It is apparent to me that Mayo and Hackett both need the bal to be effective and that Hackett wants the ball more than Floyd should let him have it. At some point during this season the Mayo and Hackett ego conflict will be much more apparent and SUC will be lucky to win 16 games as a result.